Nose: Fragrant notes of cedar wood and orange blossom, with a wonderful and award-winning rancio. Incredibly complex array of aromas. Palate: Chocolate cherry fudge with a nutty element, medium full body and a complex finish that goes on an on. The flavors are silky, with notes of coffee and buttercream. The flavors come in waves; the tannins of the oak are perfectly balanced, giving a toffee-like warmth. One of the most famous editions from this bespoke house, the Louis Royer Extra Cognac. This rare blend is a selection of some of the finest eaux-de-vie from the Grande Champagne terroir, and have been aged carefully and peacefully; sleeping in the Paradis cellar of the Louis Royer maison. 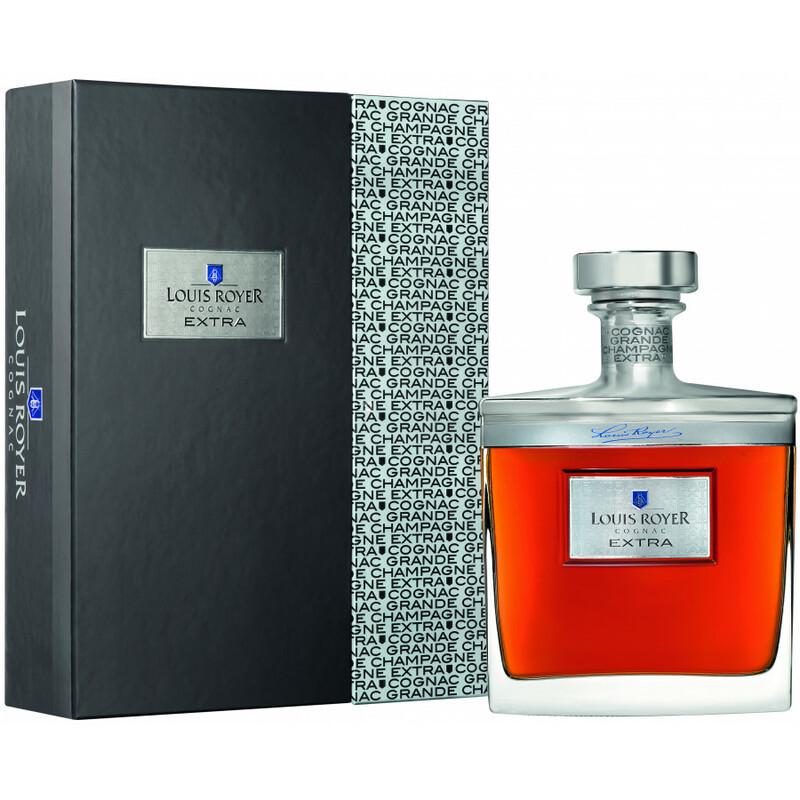 The Louis Royer Extra Grande Champagne Cognac has won a whole host of international awards, gaining much critical acclaim worldwide for its precious nectar. Assembled entirely from the fruits of the Premier Cru, it is an expression of everything that makes this terroir the finest in the region. The rancio of the Royer Extra Cognac is everything a Grande Champagne Cognac lover is after. Due to the high chalk content in the soil of this luscious cru, the eaux-de-vie that is produced is floral, spicy and highly elegant. It is wonderfully balanced and incredibly complex. The Louis Royer Extra has been aged beautifully, falling into the Extra age category, and is an immeasurable composition. The best rancios of the Grande Champagne have been carefully selected and monitored from the planting of the Ugni Blanc grapes to the final seal of the bottle, and the savoir-faire of the cellar master has been passed down through a number of generations. The knowledge and passion for the world of Cognac comes from the Royer family’s background in beekeeping. As budding nature enthusiasts, they drew their inspiration from the innovative ways that the bees gathered their pollen. In the same way that bees produced fine nectar, he selected the most treasured eaux-de-vie to assemble the Extra Cognac by Louis Royer. He wanted to replicate the hive work ethic in his maison; one where each stage of the Cognac making process was of paramount importance, and where each worker knew their role. Through commitment and teamwork, the elaboration of divine eaux-de-vie was realized. Since 1853, the Cognac house have therefore used the bee emblem to represent their work philosophy. First, enjoy the Cognac for all of its rich aromas and take it on the nose. The taste of the Cognac works in conjunction with your nose; begin slowly and gently, revealing the notes by the Cognac. Swirl it gently in the glass to release the aromas. The personality of this Cognac is rich and flavorful - enjoy it neat to allow the bouquet to dance on your nose and palate. Treasure it for sharing with small groups of friends; its rare nectar can only be enjoyed a number of times before it’s over. The 70cl decanter matches its A-list quality and Premier Cru status. It has a steel cap, and will take pride of place as the sleekest in your drinks cabinet. a great, mature Extra Cognac .. very Grande Champagne ! So I've tasted this Cognac 3 years ago for the first time. This is a very dominant, complex, rich blend of Grande Champagne. If you like strong, full blends, this is your cognac. And it comes in a beautiful, solid decanter! Famous for its bee emblem, Cognac Louis Royer traces its history back to the year 1853 and is known for a wide range of quality cognacs and Pineau. Creating cognacs from all six terroirs of the Cognac growing region, the offices and cellars of Louis Royer remain in the town of Jarnac on the banks of the Charente River where they were set up over 150 years ago. Very much continuing with the traditional methods championed by the cognac house’s name sake, Louis Royer boasts five generations of family experience and skill that continue to produce a full range of cognacs distributed on a world wide scale. Can be used in a cocktail aperitif, or straight after a meal. No review or tasting notes yet. No review of Louis Royer XO yet.